We really want to thank you for the excellent music your group played at the wedding. Everyone there said they absolutely loved it, and I don't think the wedding could have been half as exciting without your band. I can't wait for our friends get married so we can recommend your band to them! Bravo! The Uptown Rhythm Club played as both a cocktail jazz trio and as an eight-piece show band during our Promotional industry awards show at the Chicago Hilton and Towers in March 2004. We threw thirty-eight last-minute pages of cues, out-of-book song requests - pretty much the kitchen sink  at them and they delivered. Great talent, room-filling sound, a connection with the audience; they have it all. The hardest-working guys in Chicago Jazz! Jim Striebich, US Concepts Ltd. Your band was fantastic and helped make Wendy and Ryans wedding very special. Thank you for the wonderful music. I have heard so many compliments from guests about your band - and the dance instructors. You kept everyone engaged and dancing! I have been the Referrals Coordinator at The Old Town School of Folk Music for the last three and a half years and have booked Keith Baumann and his ensembles on several different occasions. I have always found Keith extremely professional to work with on the business end, and equally professional as well as multi-talented on the artistic end. 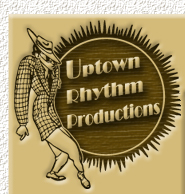 Whether the event called for Swing, Bluegrass, Hawaiian, Dixieland, or Country/Western, Keith and his Uptown Rhythm Productions has provided the appropriate music and ambiance for each event he has been booked. Clients have sent letters of praise for Keith's performances and often people who have booked him for previous events request him. I highly recommend Keith Baumann. I just wanted to thank you for making our party for Laurie so special. Your music was terrific, your band professional and you were all a lot of fun. Marilyn said your were great but I had no idea how awesome you were. The night was beautiful and dancing under the stars at the Chicago Botanical Gardens to your music was indeed an extraordinary experience. Thanks to your talented group of musicians. I cannot wait to have another party so that we can hear your music once again. Keith Baumann to was.One notch above perfect. It brought back so many memories to our families. You made our day, our day. Thank You. Thanks to both you and Brian for an excellent performance at our outdoor wedding this June. We asked for a nice mix of nontraditional ceremony music and you exceeded our expectations, you even learned a classical piece at our request. The guests loved the acoustic guitar and mandolin music at the reception, thanks again for your professional approach and good communication while selecting ceremony songs. We would recommend you to anyone! We're so glad we chose the Uptown Rhythm Club to play at our wedding. Our guests are still raving about your performance, several have told us that you were "the best wedding band they've heard." Thanks for everything.